Rare Savonnerie vanitas panel depicting a boy with a soap bubble. 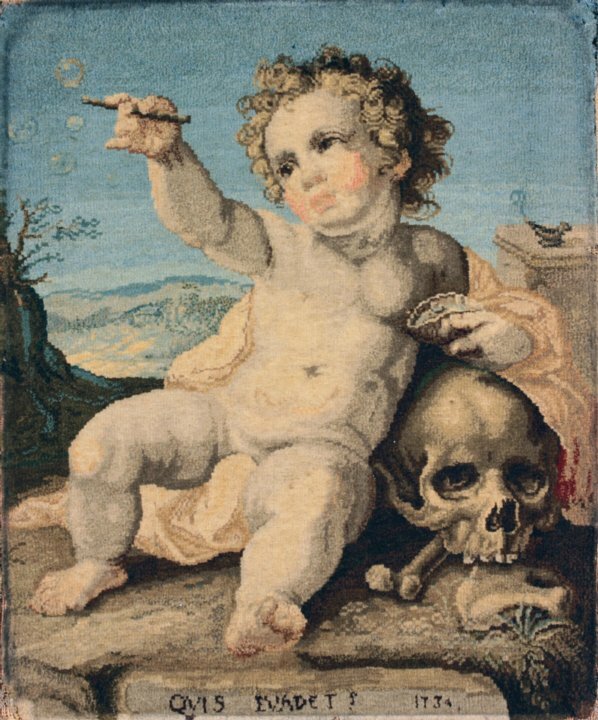 The memento mori depicts the child leaning against a skull while holding aloft a bubble pipe. There is an inscription below the child: QUIS EVADET? (Who escapes?) and the date 1734. A lantern’s flame has been extinguished, leaving only a wisp of smoke. The child's joie de vivre is contrasted with the skull, and life is seen as ephemeral as a soap bubble or a lamp’s flame. A 1594 engraving after Heinrich Goltzius of the same subject and engraved by F. Estius shows a nearly identical memento mori composition. An identical, but faded tapestry is in the Bouvier collection at the Musée Carnavalet. Fine 18th century Louis XV gilded frame.